I can understand how, in 1992, pairing Winona Ryder and Keanu Reeves together as a romantic pair could seem like a good idea, but I honestly don’t think I would have done it, even then; I have this little thing called ‘the ability to notice when people are horrible actors’. Ryder was an 80s It Girl: Lucas, Beetlejuice, Heathers, Edward Scissorhands, Mermaids. Reeves has just emerged as Ted Logan and Johnny Utah. Putting the two together must have seemed like a no-brainer, but only if you hadn’t watched other people act and only if you didn’t know what actual talent was. Letting them star alongside proven veterans like Oldman and Hopkins was the next bad idea, and it all culminated in a highly unusual picture that’s often incredibly bad. This is Bram Stoker’s tale of the vampire Count Dracula, his desperation to be reunited with his lost love Elisabeta, and the famed Van Helsing’s mission to destroy him once & for all. Dracula was once a warrior for God, but when his wife took her own life, he cursed his creator, turning to darkness with a rage that was powerful enough to curb death. Now he can become vapor, a wolf, a bat, cast spells on others, and control the weather; basically he’s a badass, undead, bloodthirsty monster. When Dracula meets the young Jonathan Harker, he also sees a picture of Harker’s fiancee Mina, who bears a striking resemblance to his own Elisabeta. Capturing Harker, the Count begins to woo Mina, while Professor Van Helsing is called upon to cure another women who Dracula has begun to change into a vampire as well. All characters converge in a final confrontation, with the fate of the world hanging in the balance. It’s not all bad, but I can’t enjoy this movie completely, not the way it was meant to be enjoyed in the 90s when it came out. The story is cool, as is the way the director stuck to Stoker’s work, letting the classic tale be told the way it would if you read the book, with bloody special effects that were probably cool at the time. 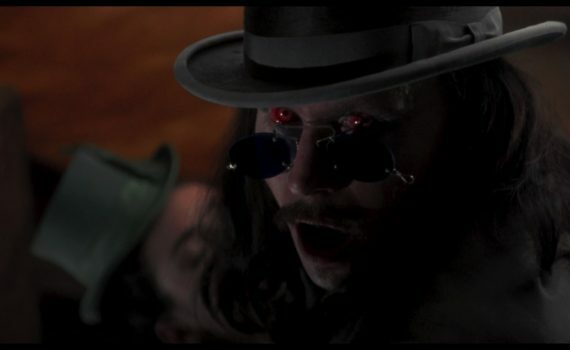 And Oldman is a great Dracula, creepy and captivating, the perfect villain. But the rest is simply weird. Coppola isn’t a good director; he struck gold with the first two Godfather films and you could make an argument for Apocalypse Now, but the rest is a mess. And then there’s the leading duo, who are simply awful, but for some unknown reason are still Hollywood mainstays. It’s baffling really, but there’s no accounting for taste. The most laughable aspect was the trio of suitors who become Van Helsing’s soldiers: Cary Elwes the over-actor extraordinaire, Billy Campbell the Rocketeer, Richard E. Grant who has been in every movie made since and shows no sign of stopping. They’re very silly, the movie is insanely over-the-top, Coppola takes a lot of risks, and most of them don’t pay off at all. Maybe I missed the boat, maybe I needed to see this when I was impressionable, but watching it now it does nothing for me whatsoever.